The Project Work Plan preview that the activites are kicking off with transnational Feasiblity studies in the framework of eMobility, transport-related plattforms & DIY engine conversion options of conventional cars towards fully eletric-driven cars. This gives the consortia the opportunity to map the state-of-the-art in each partner country as base line for our transntional implementation work. Following this, the consortia will define the needs and preferences for the trans. 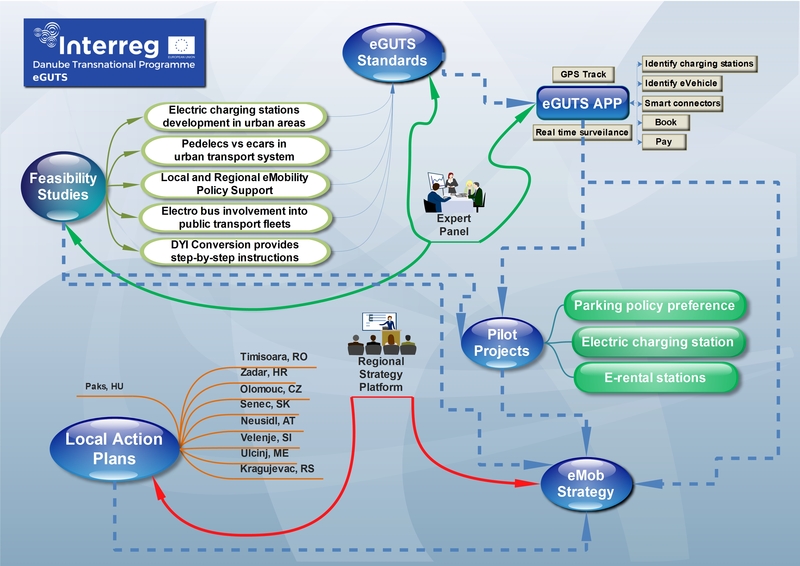 eGUTS Standards (technical pespectives) and will initate the implementation of the planned Pilot Actions (PA) in the DTP cities and regions based on the findings and common denominators (wherever possible) for the best possible transnational & technical equality. 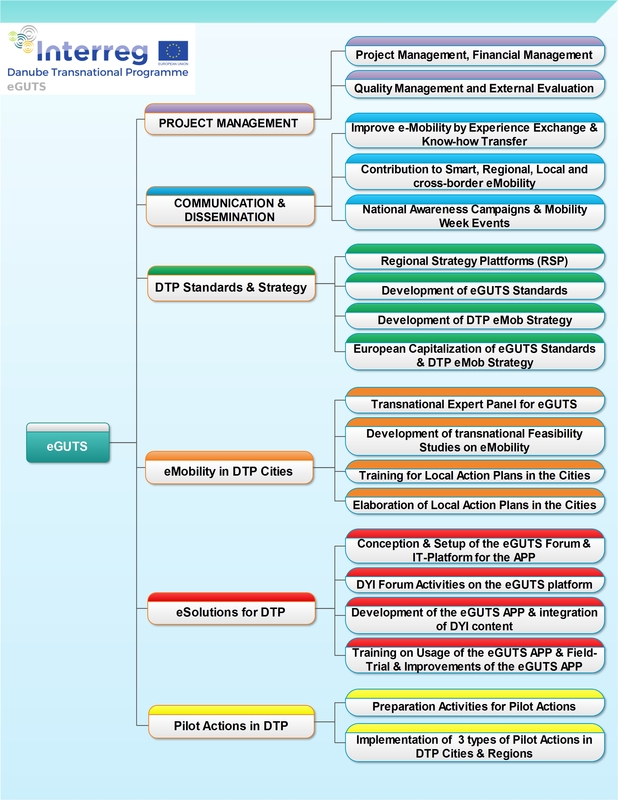 The eGUTS Standards are further elaborated with the help and input of the Transnational Expert Panel (TEP) AND the Regional Strategy Plattforms (RSP) to allow a full vertical integration on all geographic levels of development. Thereafter, the partners will follow a joint template, definition and training on the Local Action Plans (LAP) which will further contain the regional strategies with specific time lines for future investment activites on eMob in light of the lessons-learned from the implemented eGUTS PAs. The only PA which does not constitute in a specific LAP, will be the trilateral eMob race event, which will contribute to the technical and pracitcal testing of the eGUTS APP also across national borders to elaborate the transnational feasibility (and usability) of the developed applications. Once the LAPs are completed, the partners (again, together with the inputs from TEP & national RSPs) will elaborate the DTP eMob Strategy allowing all participants in the project to formulate a new eMob pathway into our common future, which will be further displayed on national and international events and conferences for the remaining months of the eGUTS project for an extended coverage on our research findings also beyond the defined communication channels and activites. All partners of the consortia will follow joint communication activites, including the opening and closure conference, national awareness campaigns, European eMob Week events and promoting the eGUTS project throughout the given project website and each partners own information channels.